What is the difference between pasta and spaghetti? 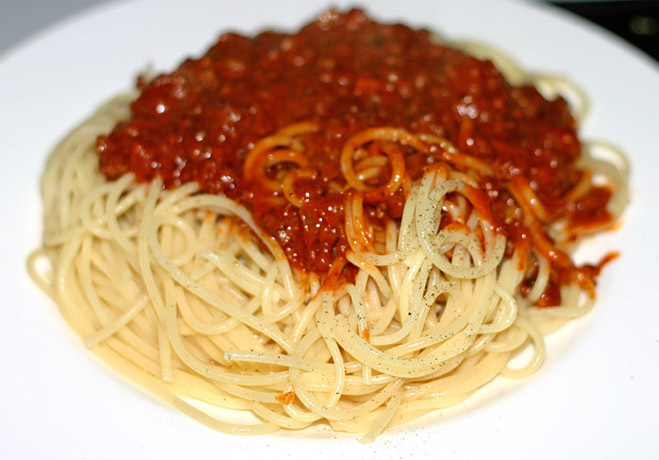 Spaghetti is a long straight thin piece of pasta. Pasta is a generic term for all different shapes of pasta. It is made the same way, boiled in water and usually topped with something like butter or a sauce like tomato. 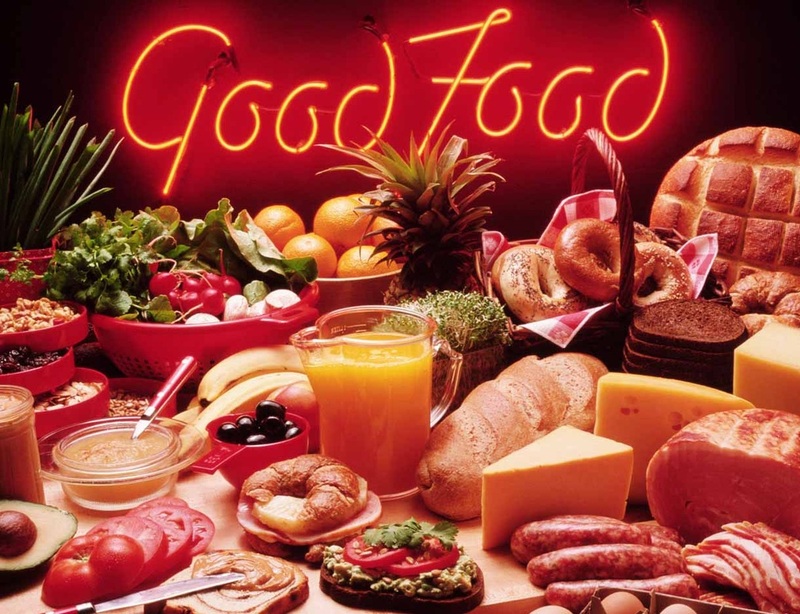 You can add different meats or no meat at all and spices and different vegetables too. Pasta is a type of noodle and is a staple food of traditional Italian cuisine, with the first reference dating to 1154. It is also commonly used to refer to the variety of pasta dishes. 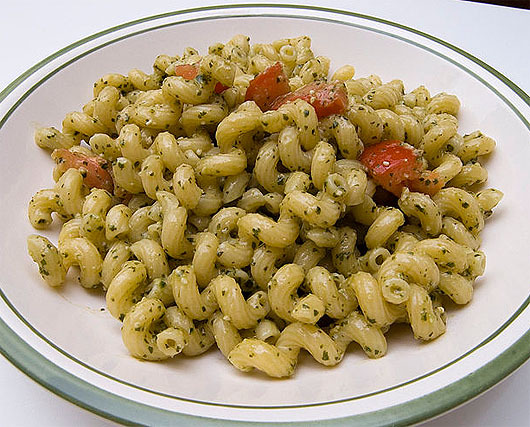 Typically pasta is made from an unleavened dough of a durum wheat flour mixed with water and formed into sheets or various shapes, then cooked and served in any number of dishes. It can be made with flour from other cereals or grains, and eggs may be used instead of water. 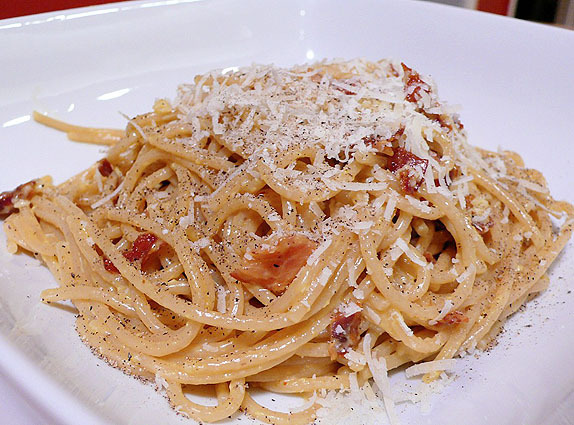 Pastas may be divided into two broad categories, dried and fresh. 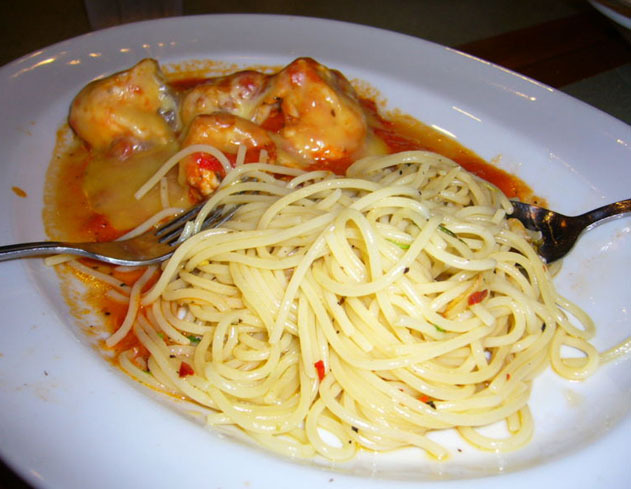 Chicken eggs frequently dominate as the source of the liquid component in fresh pasta. 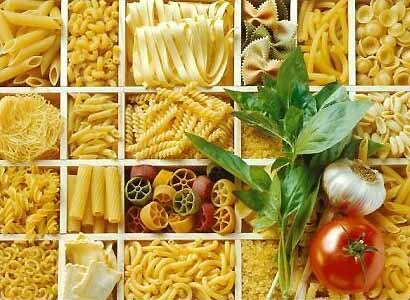 Most dried pasta is commercially produced via an extrusion process. Fresh pasta was traditionally produced by hand, sometimes with the aid of simple machines, but today many varieties of fresh pasta are also commercially produced by large scale machines. Both dried and fresh pasta come in a number of shapes and varieties, with 310 specific forms known variably by over 1300 names having been recently documented. In Italy the names of specific pasta shapes or types often vary with locale. For example the form cavatelli is known by 28 different names depending on region and town. 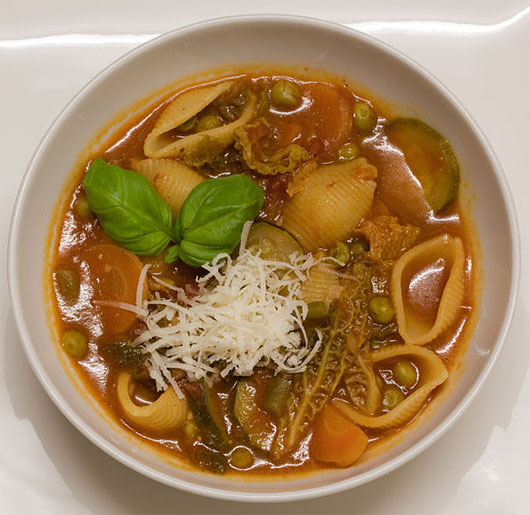 Common forms of pasta include long shapes, short shapes, tubes, flat shapes and sheets, miniature soup shapes, filled or stuffed, and specialty or decorative shapes. 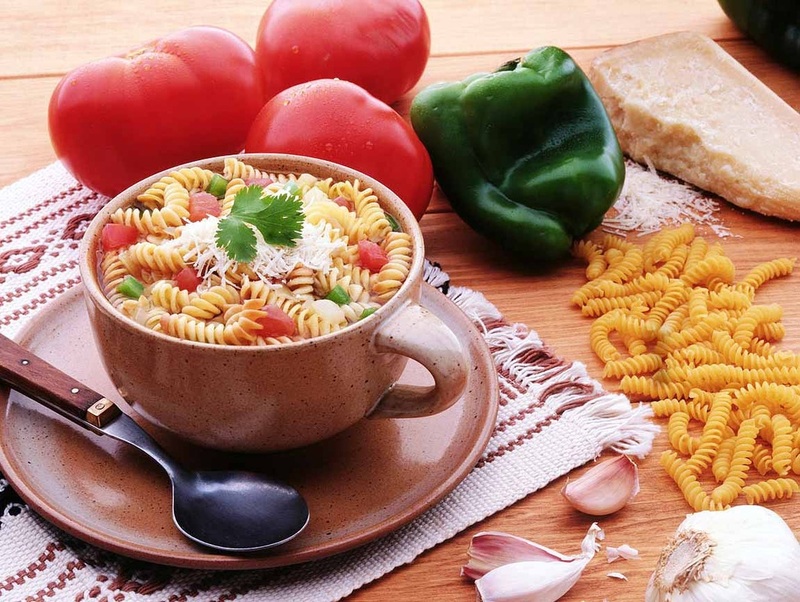 Pasta is generally a simple dish, but comes in large varieties because it is a versatile food item. Some pasta dishes are served as a first course in Italy because the portion sizes are small and simple. The servings are usually accompanied by a side of meat. 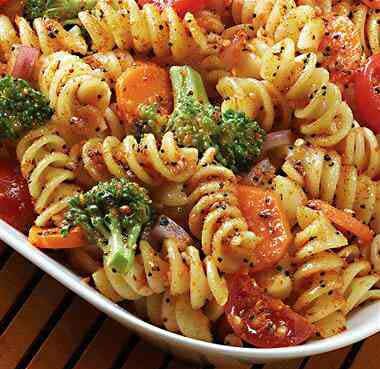 Pasta is also prepared in light lunches, such as salads or large portion sizes for dinner. Pasta sauces vary in taste, color and texture. When choosing which type of pasta and sauce to serve together, there is a general rule that must be observed. Simple sauces like pesto are ideal for long and thin strands of pasta while tomato sauce combines well with thicker pastas. 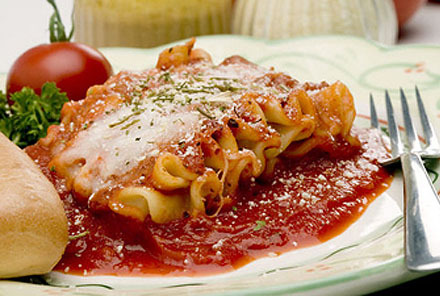 Thicker and chunkier sauces have the better ability to cling onto the holes and cuts of short, tubular, twisted pastas. Sauce should be served equally with its pasta. It is important that the sauce does not overflow the pasta. The extra sauce is left on the plate after all of the pasta is eaten. In the 1st century BC writings of Horace, lagana (Sing. : laganum) were fine sheets of dough which were fried and were an everyday food. Writing in the 2nd century Athenaeus of Naucratis provides a recipe for lagana which he attributes to the 1st century Chrysippus of Tyana: sheets of dough made of wheat flour and the juice of crushed lettuce, then flavoured with spices and deep-fried in oil. 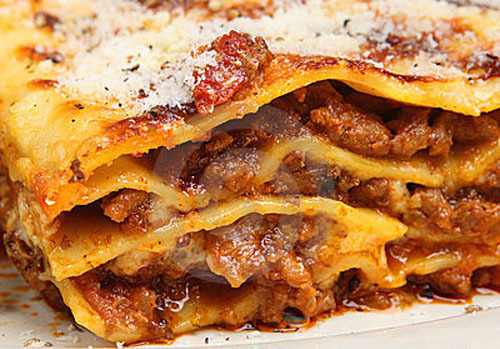 An early 5th century cookbook describes a dish called lagana that consisted of layers of dough with meat stuffing, a possible ancestor of modern-day lasagna. However, the method of cooking these sheets of dough does not correspond to our modern definition of either a fresh or dry pasta product, which only had similar basic ingredients and perhaps the shape. 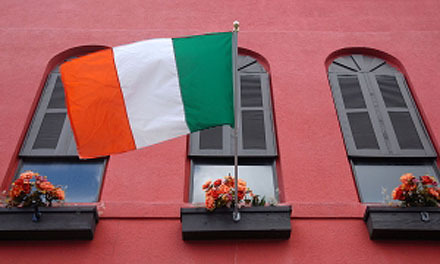 The first concrete information concerning pasta products in Italy dates from the 13th or 14th century. There is a legend of Marco Polo importing pasta from China which originated with the Macaroni Journal, published by an association of food industries with the goal of promoting the use of pasta in the United States. Marco Polo describes a food similar to "lagana" in his Travels. Pizza al taglio in Rome, Italy. 義大利 披薩 A pizza topped with spinach in Turin, Italy. Pizza is an oven-baked, flat, round bread typically topped with a tomato sauce, cheese and various toppings. 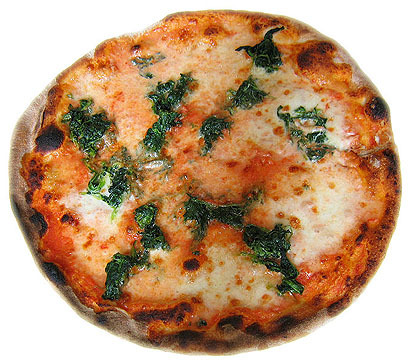 Pizza was originally invented in Naples, Italy, and the dish has since become popular in many parts of the world. An establishment that makes and sells pizzas is called a "pizzeria". 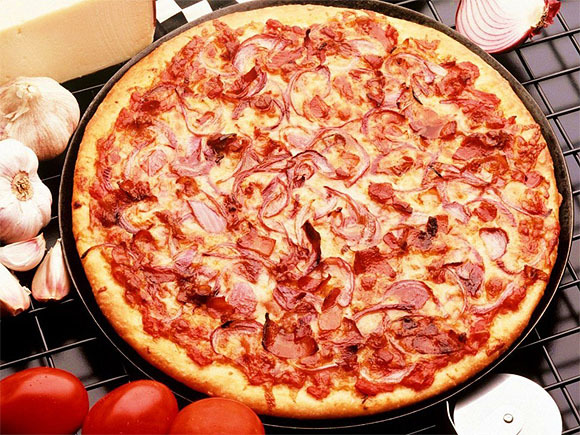 Many varieties of pizza exist worldwide, along with several dish variants based upon pizza. In 2009, upon Italy's request, Neapolitan pizza was safeguarded in the European Union as a Traditional Specialty Guaranteed dish. Some mass produced pizzas by food chains have been criticized as having an unhealthy balance of ingredients. Some studies have linked consumption of the antioxidant lycopene, which exists in tomato products that are often used on pizza, as having a beneficial health effect.